Mythic, worshipped in ancient Rome, circa 753 B.C.E.–476 C.E. The Roman goddesses of vengeance, the Furies lived in the underworld, where they tortured sinners. The children of Gaea and Uranus, they were usually characterized as three sisters: Alecto (“unceasing”), Tisiphone (“avenging murder”), and Megaera (“grudging”). Their counterparts in Greek mythology are the Erinyes. 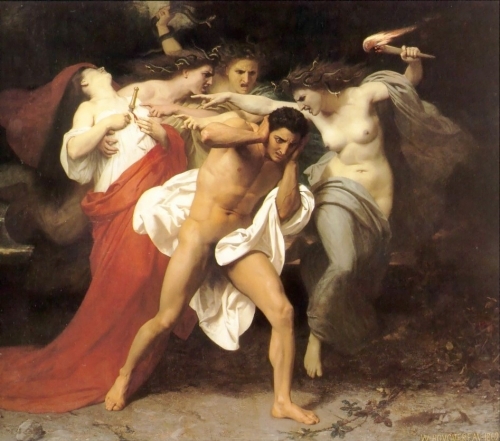 The Furies were always seen as cruel, but at the same time fair in their punishments.